Several destination-focused cruise lines call on regions with fascinating historical sites and feature onboard lectures with noted historians. Itineraries are rich with excursions to ancient ruins, fortresses, important battlegrounds, palaces and some of the world’s cultural wonders. These six cruises are ideal for history buffs. Voyages to Antiquity specializes in shore excursions to lesser-known historical sites around the Mediterranean, Africa and Far East, however, the cruises are very long (often 20 to 30 days). This October, the company is offering a shorter, 13-day itinerary embarking from Seville, Spain that includes a combination of cruising, day trips, and overnights in hotels. Historical sites in Spain include the Great Mosque of Cordova, built in the late 8th century; and Alhambra Royal Palace in Malaga, a fortress dating back between the 13th and 14th century. In Morocco, visitors can go sightseeing in Casablanca, see the Roman ruins at Volubilis and the Kasbah fortress in Tangier. Explore the waterways along the southeastern U.S. and take guided shore excursions to Civil War sites with American Cruise Lines’ “Historic South and Golden Isles Cruise.” Embark from Charleston and head to Beaufort, South Carolina’s second oldest city, known for its restored Civil War mansions. Next the ship visits Savannah, a charming coastal city with beautiful Victorian districts. The cruise also explores Jekyll Island and St. Simons Island, Georgia, where 18th century battles took place and gorgeous antebellum plantations remain. Two Civil War-themed sailing dates are available in March 2016. Traverse the Rhine River with Abercrombie and Kent on a WWII history cruise to commemorate the 71st anniversary of the armistice. The Amadeus Silver III embarks in May 2016 from Amsterdam on a 10-day journey to Basel, Switzerland. Resident tour director, Dr. James McKenzie-Hall, a specialist on WWII, will host the voyage. The cruise tour includes exclusive excursions from Amsterdam to Arnhem (the site of Operation Market Garden), where guests can visit the Hartenstein Airborne Museum and Oosterbeek War Cemetery. In Cologne, tour the Roonstrasse Synagogue (the only Jewish prayer house restored after the war), and explore a Gestapo prison. Another unique historical site is a hidden amphitheater in Heidelberg, Germany used by the Nazis for political gatherings and solstice festivals. For a combination of natural wonders and historical attractions, Ponant’s Le Boreal sails on a 12-night cruise from Valparaiso, Chile to Guayaquil, Ecuador in March 2016. Available excursions abound, such as the Pintados Geoglyphs near Iquique, Chile, the San Miguel de Azapa Archaeological and Anthropological Museum in Arica, Chile and a visit to the colonial mansions of Peru’s Arequipa, a picturesque city that also showcases mummies and artifacts from the Inca Empire at the Museum of Andean Sanctuaries. In Salaverry, cruisers can visit nearby Chan Chan, the largest adobe city ever discovered, as well as the temples of the sun and moon — two fascinating structures. Optional overland extensions to Cusco and Machu Picchu are also available. For a luxury cruise experience to iconic Egyptian historical sites, Sonesta offers several Nile River voyages on boutique ships carrying around 100 passengers. Embarking round-trip from Aswan, the Moon Goddess sails north to Luxor and the Temple of Philae, which dates back to around 370 B.C. 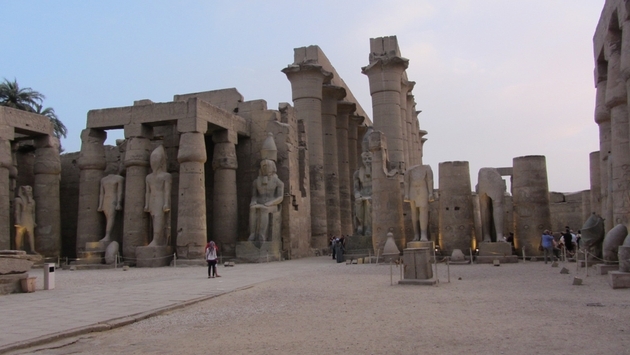 Stops include Valley of the Kings and Queens, the Karnak Temple and Luxor Temple as well as the Kom Ombo Temple. Numerous departures are available. Get a taste of Viking history as well as a peek into some of the Baltic cities’ archeological gems on a 12-day cruise from Copenhagen. First, passengers can tour the Rosenborg Palace before stopping at Roskilde, a city center during Viking times that is now home to the Viking Ship Museum. Next, visit Tallinn, one of Europe’s best-preserved medieval walled cities, followed by two days of sightseeing in St. Petersburg. There, cruisers can see the 18th century Peter and Paul fortress and the iconic Summer Palace. The ship also calls in Helsinki, Finland, and Stockholm, Sweden with a special private farewell at the Vasa Museum, home to the world’s only preserved 17th-century warship. Two departure dates are available in May and June 2016 through Tauck’s small ship cruise program. Amber Nolan loves to be on the water, and although she enjoys the fun and excitement of larger cruise ships, she prefers setting sail on smaller vessels to unique destinations. Originally from western New York, this restless traveler has a knack for finding creative ways to travel and befriending interesting characters along the way. On her most recent adventure, she hitchhiked on private aircraft across the United States. She previously served as the cruise editor at Sherman’s Travel but her work can also be found on 10Best.com and USA Today Travel. She current resides in South Florida.